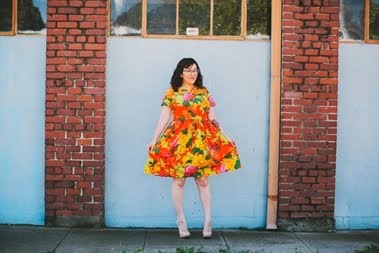 May I brag about my super talented friend, Rochelle, for a minute? Rochelle runs the blog, Lucky Lucille, and recently opened an online store with some adorable items that I would like to share with you. 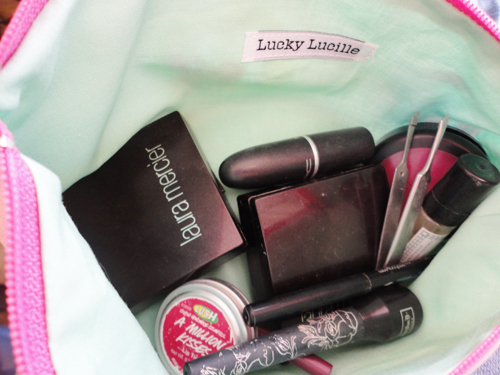 The day that Rochelle opened her online shop I HAD to buy myself this bag for my makeup. 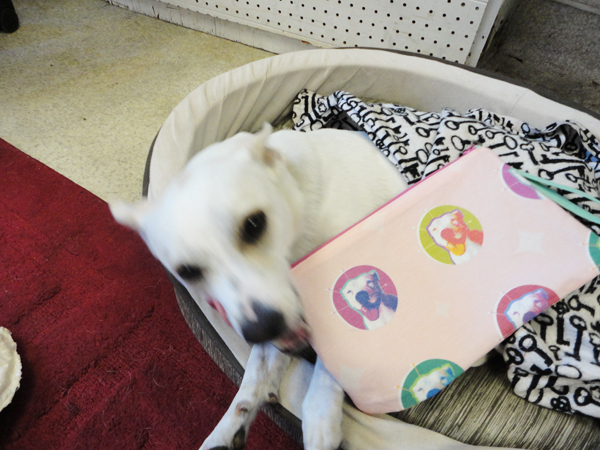 Rochelle designed the fabric herself and incorporated her dog Lucille into the design, which is so clever! I ordered it late last week and had it in my hands first thing on Monday. Pretty fast for shipping from Vermont to California! Before I put my makeup inside I couldn't hep but admire the craftsmanship that went into the bag. The zipper was perfect (I'm jealous that I can't do zippers this well), the stitches couldn't be more uniform, and the tag is adorable! This doggy poop bag holder is one of the coolest ideas! It's lightweight and easy to carry on walks when it's attached to Frankie's leash. Plus, it's wayyyy cuter than the plastic ones you can buy in stores. Rochelle was sweet enough to send a surprise for the cats, so they wouldn't be left out. 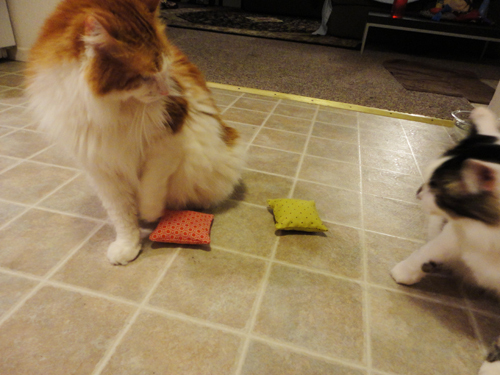 These tiny little pillows are filled with catnip. As you can see, Lebron was very excited about them. 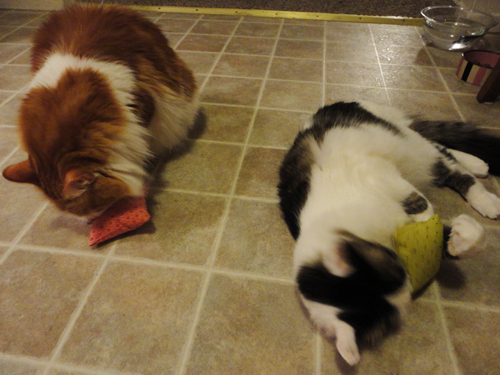 He had a little trouble sharing with Stella. But then he got over it. 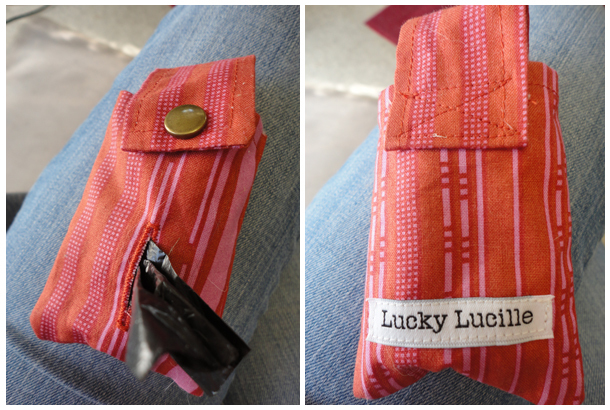 If you are looking for some unique gifts or stocking stuffers for the upcoming holidays, then I would highly recommend the Lucky Lucille shop! Rochelle: Stella, Lebron, Frankie, and I say, "thank you so much!" Love Rochelle and love her dog! Thanks for helping out a friend! that is all the most adorable thing ever! 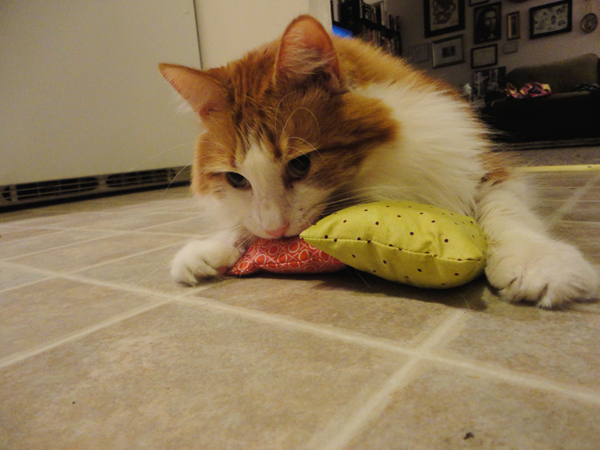 I want to get our cat some o' that nip! The makeup bag looks fantastic! 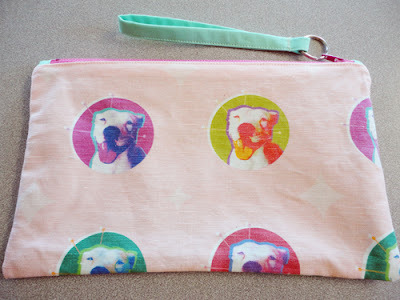 I love that she has her adorable pup on the fabric! I love her shop! So cute! I love Lucille! I squeal every time I see a photo of her up on IG.